Black Country Communion have released a studio video for their new track Collide. The promo comes hot on the heels of the announcement that vocalist and bassist Glenn Hughes, drummer Jason Bonham, keyboardist Derek Sherinian and guitarist and vocalist Joe Bonamassa will release their new album BCCIV on September 22 via Mascot Records. Explaining the reason to get back together to record the follow-up to Afterglow after disbanding in 2013, Bonamassa said: “I just felt the time was right for Black Country Communion to go back into the studio and write and record a new album. He added: “All four of us wanted to make a record that stood up to the first three albums, however, the new album is more of a progression as we wanted to be careful not to repeat the previous albums. 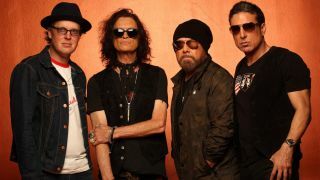 Black Country Communion have lined up two UK shows in early January in support of the record. They’ll perform at Wolverhampton’s Civic Hall on January 2 and London’s Hammersmith Apollo on January 4. Tickets go on general sale on Friday, August 4 via Ticketmaster. BCCIV is now available for pre-order. Find the artwork and tracklist below.